The average cost of memory care in Clayton County is $3,503 per month. This is lower than the national median of $4,650. Cheaper nearby regions include Rockdale County with an average starting cost of $2,750. To help you with your search, browse the 18 reviews below for memory care facilities in Clayton County. On average, consumers rate memory care in Clayton County 4.5 out of 5 stars. Better rated regions include Newton County with an average rating of 5.0 out of 5 stars. Caring.com has helped thousands of families find high-quality senior care. To speak with one of our Family Advisors about memory care options and costs in Clayton County, call (855) 863-8283. Clayton County is in the Atlanta-Sandy Springs-Roswell, Georgia, Metropolitan Statistical Area and has some 285,153 residents, including 9 percent aged 65 or older. In Georgia, the 2015 population of 140,000 seniors is expected to rise to 190,000 by 2030, with an estimated 11.6 percent of the Medicare beneficiaries expected to have Alzheimer's disease or a related condition needing a higher level of attention. The Georgia Department of Community Health licenses, regulates and oversees operating procedures at these facilities, which are called memory care units. Three MCUs are in Clayton County in the cities of Jonesboro, Forest Park and Morrow. Clayton County's cost of living is 94.3, slightly lower than the U.S. average rating of 100, but housing is significantly lower at 53. Healthcare in Clayton County is also 10 percent less expensive, so placing a loved one in an MCU in this area could result in extra money at the end of the month. People aged 65 and older find the state tax laws to be friendly toward their age bracket. Social Security dividends and $65,000 of income earned annually after retirement are exempt from taxation. There are also existing property tax exemptions in place, and with the state sales tax of 4 percent, seniors in Clayton County on a fixed income may afford more for healthcare. The crime rates are greater than the national average at 80.9 for violent crime and 72.8 for property crime, as opposed to 31.1 and 38.1 respectively. Families must ask possible MCUs in Clayton County about security measures. Memory care units should have guards, self-locking doors and security cameras to keep crime out and the patients safely within the premises. Sperling's Comfort Index rates Clayton County at 66 out of 100 based on how frequently the temperature is comfortable and the humidity is low. Sunny days surpass the national average by 217 to 205, and the area only gets 1 inch of snow and 50 inches of rain annually. The yearly temperature span is 58 degrees, from 90 in July to 32 in January. Seniors should find Clayton County's climate to be quite livable. Memory Care costs in Clayton County start around $3,503 per month on average, while the nationwide average cost of memory care is $4,799 per month. It’s important to note that memory care rates in Clayton County and the surrounding suburbs can vary widely based on factors such as location, the level of care needed, apartment size and the types of amenities offered at each community. 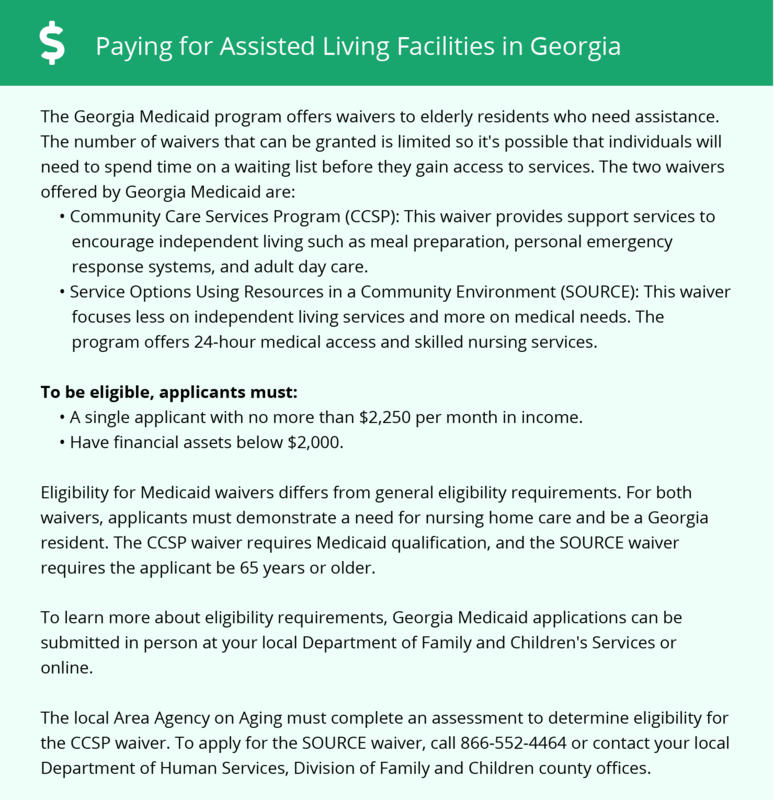 Clayton County and the surrounding area are home to numerous government agencies and non-profit organizations offering help for seniors searching for or currently residing in an assisted living community. These organizations can also provide assistance in a number of other eldercare services such as geriatric care management, elder law advice, estate planning, finding home care and health and wellness programs. To see a list of free memory care resources in Clayton County, please visit our Assisted Living in Georgia page. Clayton County-area assisted living communities must adhere to the comprehensive set of state laws and regulations that all assisted living communities in Georgia are required to follow. Visit our Memory Care in Georgia page for more information about these laws.